The growing deployment of a number of ECUs and electronic systems in automobiles owing to the requirement for enhanced networking & communication between these systems is driving the automotive transceivers market growth. Increased demand for transceivers in modern vehicles is attributed to the efficient in-vehicle networking and the data exchanged between the control units & related systems. Moreover, the need for more efficient inter-network communication in high-end electronics systems such as ADAS, engine management systems, powertrain systems, etc., is a major factor that generates industry demand. These components offer several features to electronic systems such as increased fuel efficiency, low carbon dioxide emissions, and high quality, further creating growth prospects for the automotive transceivers market across the globe. The increasing safety regulations and low vehicle emission rules in several countries are creating the need to deploy these components, further adding to the industry expansion. For instance, the European Union’s New Car Assessment Programme (NCAP) specifies vehicle safety requirements for all cars sold in the region. The program also includes several safety campaigns aiding consumer awareness and the introduction of various vehicle safety concerns. As a result, all European vehicle manufacturers need to deploy efficient safety systems in the newly developed vehicles. These factors provide advanced comfort & safety to consumers, resulting in a high integration of ADAS and infotainment systems, driving the automotive transceivers market growth. Increasing electronic system complexities will hamper the performance of LIN- and CAN-based products in the automotive electronics market. The complex electronics systems require a high level of integration and communication between the subsystems & components, which is not fulfilled by conventional transceiver interfaces. The issue can be overcome by designing robust modules and the inclusion of highly integrated semiconductor technology. LIN protocol valued at over USD 1 billion in 2017, has experienced a high popularity in the automotive transceivers market owing to the deployment in the body electronics applications that include mirrors, accessories, power seats, etc. The increasing requirements for high-end body electronics to be deployed in modern passenger and luxury cars are creating a demand for LIN interfaces. These components offer cost-effective and cheaper communications in several automobile applications, which do not require high versatility. As a result, LIN interfaces are integrated into low-cost applications over alternatives such as CAN and FlexRay, driving the demand for the market products. In the automotive transceivers market, CAN protocols are increasingly being deployed in passenger and commercial vehicles due to their usage in body electronics, powertrain, chassis & safety applications. The innovations in the overall automobile electronics industry such as the development of self-driving technologies, alternative powertrain solutions, and rugged architectures will also bolster the demand for these components. Applications such as parking assistance, car security, etc., are witnessing the deployment of CAN interfaces in huge amounts owing to the efficient communication provided between various ECUs. Moreover, manufacturers including Infineon Technologies, NXP Semiconductors, etc., are developing application-specific CAN interface solutions to be deployed in vehicle body parts, engine transmission systems, etc. The powertrain automotive transceivers market is anticipated to grow at a CAGR of over 4% from 2018 to 2024, owing to the need for low fuel consuming engines in modern vehicles. The increasing demand for low-emission and high-capacity engines across the global automobile industry is a major factor adding up to the utilization of CAN and FlexRay interfaces in the powertrain systems. Moreover, the increasing production & consumption of EVs in the U.S., China, etc., has created a high demand for alternative powertrain solutions, further accelerating the market growth. The industry players have developed several high-speed transceivers that are applicable in systems such as powertrain, chassis, and safety. For instance, NXP Semiconductors has introduced its multi-purpose CM0902 CAN transceivers that are applicable in various applications including automotive powertrain & safety, robotics, factory automation, etc. Infotainment applications dominate the automotive transceivers market with around 35% of the revenue share owing to the developments of multimedia, navigation, and advanced telematics solutions. The increasing focus on providing comfort and added vehicular connectivity through advanced infotainment systems contributes to the demand for these products. Additionally, the auto suppliers have developed application-specific ECUs, creating a need for compatible transceiver components, further developing the market. The German automakers are increasingly consuming the infotainment systems and products due to the development of luxury cars and innovations in these systems. 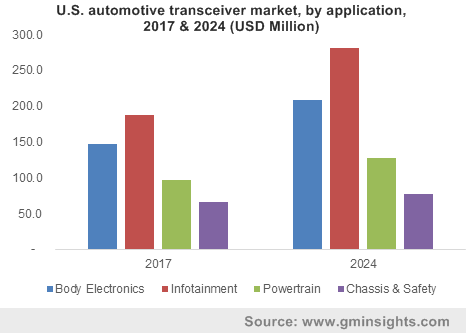 North America automotive transceivers market is anticipated to reach over USD 790 million by 2024 owing to the development of automated mobility and driver assistance technologies in the automobile industry. The government regulations and policies in the U.S. that specify increased vehicle safety to support the reduction of road fatalities will contribute to industry growth. Moreover, the stricter carbon dioxide emission policies for all industry verticals enforce OEMs to deploy electronic systems & components that comply with these regulations & legislation and support the low-pollution initiatives. These factors coupled with the increasing popularity of connected & innovative mobility solutions in the U.S. are contributing to industry expansion. In addition, the Asia Pacific automotive transceivers market is witnessing a high growth and dominates the industry with a revenue share of over 50% owing to the presence of several automobile and electronic systems & component manufacturers in countries including China, Japan, South Korea, India, etc. Key players in the automotive transceivers market include Infineon Technologies AG, NXP Semiconductors, NXP Semiconductors, Texas Instruments, STMicroelectronics, Renesas Electronics Corporation, National Instruments, Analog Devices, Inc., Microchip Technology, Inc., Broadcom, Inc., etc. The companies are focused on developing highly innovative and compatible products to survive severe competition in the market. The players are currently working on developing transceiver modules that cater to the requirements of automated mobility technologies across the globe. Moreover, these companies focus on R&D activities to offer technical innovations to automotive Tier 2 suppliers and OEMs. 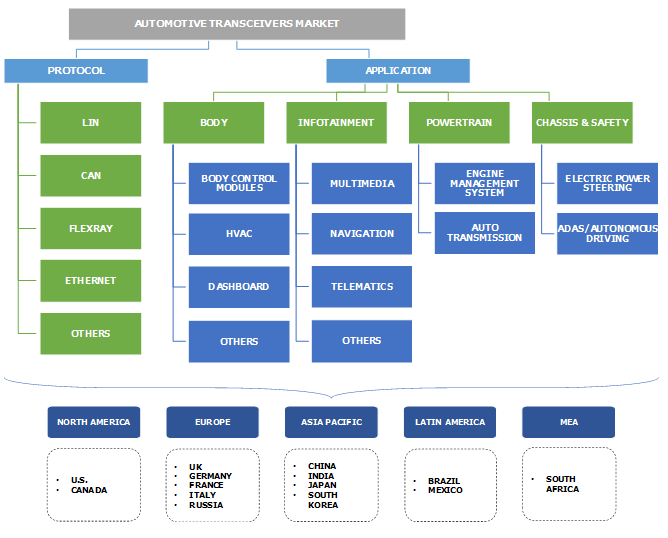 The automotive transceivers market is competitive owing to the presence of leading & established manufacturers globally. These companies majorly develop partnerships with the OEMs and system manufacturers for efficient product delivery. Additionally, OEMs have partnerships with the leading electronic systems and component providers to avoid product issues and untimely deliveries. The component manufacturers enhance the product designs and process technologies to sustain the highly competitive market. The companies adopt collaboration strategies with other organizations that provide benefits such as shared operational costs, technical acquisitions, and added production capabilities. Several players are adopting production processes that include eco-friendly technologies and comply with international health & safety laws to further strengthen their position in the global market. Furthermore, companies adopt efficient marketing strategies and develop dealerships in various regions to cover the local markets across the globe.